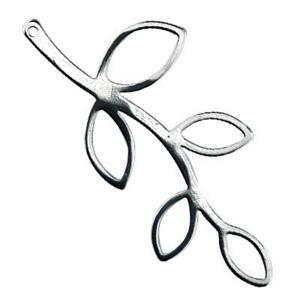 Sterling Silver 20x44mm Large Open Leafy Vine Link, 1mm Hole. Wholesale silver findings for jewelry making. It's a pendant, it's a link, it's whatever you want it to be! this versatile leafy vine can be used in so many ways. The wide open leaf silhouettes are easy connection points for silver chain or beadwork. The vine stem has one small drilled hole at the end as well. This piece looks good as a festoon link focal point on silver necklaces or bracelets. Or, it can be interpreted as a chandelier earring finding. Show us your jewelry making ideas on social media and be sure to tag #HalsteadMakers. This open leafy vine link is so versatile! It's fun to play around to create different designs that my customers love. It also works well along side my Art Nouveau-and-nature inspired handcrafted designs. I absolutely love this leaf charm. It is the perfect piece for making a family tree lariat. The quality of this tree branch is excellent.